Labour’s shadow health minister said the party would attempt to bring down Peterborough City Hospital’s Private Finance Initiative debt if elected to form a government. The hospital, which recorded a deficit of £17.7 million last year, is due to pay £18.3 million in PFI payments in 2017/18. The PFI deal was agreed under a Labour government, but responding to that point Jon Ashworth said PFIs were originally a Conservative idea. On a visit to the city with local MP Fiona Onasanya he said: “We did sign a PFI contract in order to rebuild hospitals, but now 10 to 15 years down the line we think it is the rational thing to do to look at those contracts again and see if they can be renegotiated so we can get a better deal for the taxpayer. “That is something that Fiona raised with me more or less in her first day in the House of Commons. It can be done. 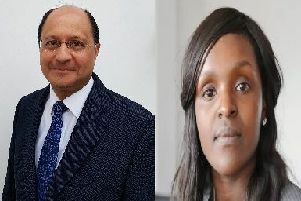 Both Mr Ashworth and Ms Onasanya said government cuts were to blame for delays at A&E and cuts to IVF services by the county’s clinical commissioning group.